(c) The current warming will further increase by about 50% by the end of the century due to the loss of the sulfate cooling influence and the ongoing response of the ocean, even without further emissions. (d) Keeping global warming and associated impacts as small as possible for as short a time as possible will require both aggressive efforts to phase up removal of CO2 from the atmosphere/ocean/biosphere system and climate intervention to counteract the strong warming influence of elevated greenhouse gas concentrations until they are returned to near their preindustrial levels. ∙Efficiency, which offers opportunities to achieve cost-effective reductions in the short-term, including many actions that have financial payback times of a few years or less, especially relating to reducing energy use for buildings and lighting. Coupling with footprint analyses and conservation efforts is important so that the gains are not offset by increased consumption. ∙Short-lived Green House Gas Reduction can contribute significantly to counter-balancing the warming influence from reducing SO2 emissions as use of coal is ended. Capturing and utilizing methane emissions from untreated sewage, waste disposal sites and sewage treatment facilities, petrochemical facilities and pipelines, and agriculture can also provide major near-term benefits at quite modest cost. Cutting emissions of black carbon and precursors to tropospheric ozone will have substantial health, air quality, and climate benefits. Substituting alternatives for HFCs is also possible with significant benefits. ∙Ground Transport needs to be rapidly electrified, taking advantage of emerging technologies such as ultracapacitor-based/slow discharge batteries that can overcome the inherent problems of lithium and other chemical batteries. The co- benefits of eliminating fossil-fuel based air pollutants, especially as cities become larger, and from refining and transport of such fuels justify the change even before considering the contribution to reducing CO2 emissions. Promoting much more rapid shifts is essential. ∙Biofuels are likely the best near-term option for aircraft and ships and to replace natural gas heating in buildings. Ensuring that generation of biofuels does not lead to illegal land grabs, deforestation and disruption of food production will be critical. ∙Reforestation and Local Land Improvement can take up carbon as well as improve local weather conditions, moderate threats to biodiversity, improve water quality and retention, and enhance overall land productivity. Develop and phase up Carbon Dioxide Removal to the scale needed to reduce the atmospheric CO2 concentration to the level needed to return the global average temperature to roughly its mid-20th century value as quickly as possible whilst protecting current environmental balances and taking cognizance of the natural rates of sequestration that can be achieved, while recognizing that failure to curtail anthropogenic emissions will overwhelm these efforts. The most promising techniques for increasing carbon removal and sequestration are geotherapy approaches that include afforestation and biochar on land to enhance carbon storage in soil, and ocean fertilization. Ultimately restoring the climate, sea level and ocean acidification to levels, compatible with achieving the UNFCCC objectives, will require nations to get significantly below zero emissions. ∙Potential global intervention can be responsibly evaluated: Scientific understanding of the functioning of the Earth’s climate system is, because of all the observations and learning from weather forecast and historical period verification, much better for conditions of the recent past than for conditions with an elevated global average temperature, for which only theoretically plausible model simulations and reconstructions of distant paleoclimatic warm periods are available. As a result, assessment of the potential benefits and impacts of undertaking global climate intervention as a supplement to mitigation and adaptation aimed at limiting the increase in global average temperature to well less than 1.5ºC can likely be usefully and confidently undertaken with the current generation of climate models. While resorting to climate intervention would be an admission that mitigation and carbon removal have not yet proven adequate, limiting both the amount and duration of global warming, and so the need for the intervention-driven cooling, is critical as it is likely that the larger the cooling offset needs to be, the greater the likelihood that the unintended consequences of climate intervention might exceed the roughly plus or minus 0.5ºC range of natural variability that natural and societal systems have experienced and withstood in the past. With the likelihood of significant temperature overshoot based on current national commitments, evaluation, testing and development of capabilities has become an urgently needed step toward risk reduction. This document represents the views of the Climate Institute, as indicated by the endorsement of its President, and has been further endorsed by the signers indicated below, who do so as individuals, with their affiliations shown only for purposes of identification. For an elaboration of many of the points in our statement, we have appended a paper describing in more detail the situation and options that we face and that spurred our development of this submission. 1Especially noting that the equilibrium sensitivity of sea level to changes in global average temperature based on paleoclimatic evidence is roughly 15-20 meters per degree, with an equilibration time of perhaps 1-2 millennia. 2Paleoclimatic evidence makes very clear that glacial ice melts back much more rapidly in response to positive radiative forcing than it is created in response to negative forcing as compared to the baseline forcing values prevailing throughout the Holocene. 3Signers do so as individuals; affiliations are only shown for purposes of identification. This response to the UN Talanoa Dialogue has been prepared by a consortium of leading climate change scientists, academics and institutions that are focused on developing and encouraging realistic and practical technical and policy responses to stabilize the climate at a level that will fully meet the stated objective of the UN Framework Convention on Climate Change. Our conclusion is that the risk of very serious environmental and societal impacts, including the potential for a near-term, nonlinear and irreversible step change in the planet’s climate is so great that an aggressive climate restoration program needs to be initiated to return the global average temperature to no more than 0.5ºC above its preindustrial level. This program must be comprehensive, pursuing a multi-pronged approach that includes greatly strengthening efforts based on efficiency and mitigation, building up of efforts to restore carbon levels in the soils and land cover, and researching and then likely needing to initiate climate intervention efforts in the near-term to not only ensure the global average temperature does not exceed 1.5ºC at any time (so no overshoot), but also will put the climate on a pathway to a global average temperature characteristic of the mid- to late 20th century when conditions were generally within the range of natural variability under which society and prevailing ecosystems were not facing severe threats (a global average temperate estimated to be no more than 0.5ºC above its preindustrial level). ∙At the time of writing, the 12-month running average of the atmospheric CO2 concentration at Mauna Loa is 406.7 ppm. 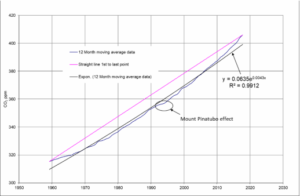 The rate of increase is growing at a rate that is at least as fast as exponential. This is not commensurate with the target of restraining the increase in the global average temperature to below 2ºC, much less 1.5ºC. ∙Coral reef bleaching and sea ice loss were observed in 1980, which was before the atmospheric temperature started its significant rise to today’s level. Thus, aspirations to limit the temperature increase to 1.50C are ignoring the extreme risks of even a 0.5 to 1ºC increase that observational science has made clear. ∙With increasing geopolitical rivalries and the re-emergence of nuclear and conventional arms races between the main economic blocks, the theoretical probability of successfully agreeing to deep cuts in CO2 emissions within the current negotiating framework of the COP, which does not include security agreements, is too low to be relied upon as the sole solution. Moreover, population growth and aspirations for economic development in the less developed nations are likely to continue to exert upwards pressure on CO2 emissions. ∙Since accurate measurements began in 1958, the strong correlation between the observed CO2 concentrations at Mauna Loa and cumulative fossil fuel use (r=0.99949) makes clear that, on a net basis of biospheric emissions and uptake, the planet’s ecosystems have been unable to sequester any measurable quantity of fossil fuel CO2 emissions. Thus, even in the hypothetical scenario of a zero-carbon economy, atmospheric CO2 levels seem very likely to remain dangerously high for the foreseeable future. ∙International policy has not focused on ocean acidification and sea level rise in a way that can be deemed comparable to the attention placed on the target setting for global average temperature. Paleoclimate data suggests a quite high sensitivity of sea level to the atmospheric CO2 concentration (as an indicator of global average temperature). At 400ppm, there is roughly a 2 out of 3 probability that sea level increases will be between 10m and 30m with a median of 23m1. 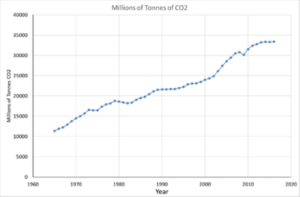 ∙Whilst the focus of international policy on climate change has been on reducing anthropogenic CO2 emissions, there has been no equivalent focus on removing CO2 from the atmosphere or stabilising the planet’s radiative balance to prevent near term amplification of the initial warming effects through various positive feedback mechanisms. Even the lowest- extreme emissions scenario used in IPCC-AR5 (RCP2.6) assumes CO2 levels will peak at 440 ppm. Current observations suggest that a 440 ppm limit is not enough to avoid widespread activation of positive feedbacks, including carbon feedbacks associated with permafrost and soil carbon. Avoidance of undue activation of these feedbacks must be an immediate policy objective. ∙The scale of solar climate intervention necessary to counterbalance warming above the level which can be tolerated will increase exponentially with delays in the initiation of deployment. Furthermore, without a climate restoration programme, the resulting ecological, economic, humanitarian and political turmoil seems likely to make the organisation of the much larger intervention needed at a future time virtually impossible. Thus, we see no other responsible step than by committing now to protecting future generations by initiating an aggressive climate restoration programme. ∙The ongoing loss of sea ice and snow cover and increasing releases of methane and carbon oxide from warming permafrost, clathrates, accompanied by the resulting increase in atmospheric water vapour from the increased forcings that are induced, have the potential to create the conditions for large-scale, step-like changes in the climate. The profile of the resulting atmospheric temperature change is not significantly dependent on the characteristics of the individual amplification mechanisms or on the correlations between them. Rather, it is an inherent emerging property that arises when applying a suitably large perturbation to the climate system by increasing atmospheric CO2. The resulting magnitude of the change is the simple aggregate of the natural maxima of each amplifying mechanism. After an initial spike in temperature, the final equilibrium temperature and the time to reach that higher value will depend on the rate at which heat is (or is not) transferred to the deep ocean, but once prompted, avoiding this much worse condition will become very difficult and many of the ecosystem and cryospheric damages will not be able to be reversed. ∙Because of the risk that an initial temperature change starts triggering multiple amplifying mechanisms that self-reinforce, no temperature rise can be considered ‘safe’, especially when factors such as sea ice loss and atmospheric methane levels are already observed to be rising concurrently. Thus, the mainly economically determined and politically motivated objective of limiting the increase in global average temperature to 2ºC (and even the aspirational goal of 1.5OC) introduces significant climatic risks, especially if these are viewed as tolerable long- term increases in the global average temperature, as the IPCC special report appears to be interpreting the international agreement. 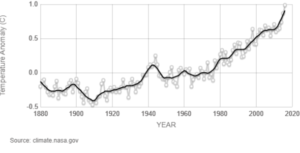 To fulfil the UNFCCC objective’s commitment to avoiding “dangerous anthropogenic interference with the climate system, the objective of the COP negotiating process needs to be to return the global average temperature to no more than 0.5ºC above the 1881-1910 average temperature baseline. 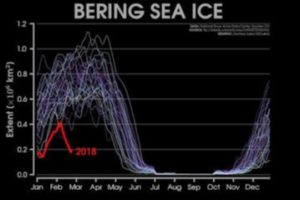 ∙At the time of writing (March 2018), there has been a major failure in Arctic winter time ice formation with new low levels being recorded that are well below the predictions from global climate models. These low levels have been occurring simultaneously with elevated methane levels (and so presumably releases) to the west of Greenland and elsewhere in the Arctic. Taken together, these events suggest that deteriorating conditions are appearing more rapidly than simulation models are projecting and that further warming may soon trigger a rapid and irreversible change in the climate, thereby closing the window for a climate restoration programme without taking extraordinary actions such as regional, and quite possibly, global climate intervention aimed at counteracting the warming and melting/thawing occurring during Northern Hemisphere summers. ∙The inherent irreversibility of many of the impacts associated with a warming climate on time scales that would benefit humanity, in particular biodiversity loss and the loss of mass from ice sheets accompanied by the consequent sea level rise, makes clear that mitigation alone, even accompanied by slow rebuilding of soil carbon and land cover, will not by themselves be able to ensure that the objective of the UNFCCC can be achieved. ∙Because of factors such as the diminishing reflectivity of the Arctic, increasing ocean heat content and activation of natural carbon feedbacks that have initiated increased emissions of CO2 and methane, then the CO2 level necessary for stabilizing the climate appears likely to be approaching its preindustrial level, thus in the region of 280ppm. ∙Paleoclimate data suggest that relying on natural processes alone for return of the CO2 level to this lowered value will take, at best, many hundreds of millennia, which is far beyond the time by which the negative consequences will have irreversibly altered even moderately elevated coastlines, destructively shifted landscapes, and greatly diminished biodiversity. The fundamental physics that determines the relationship between CO2 levels and radiative forcing precludes substantial cooling influences until CO2 levels have significantly reduced, thus delaying any effective natural recovery by many thousands of years. ∙Therefore, restoring the climate to conditions suitable for meeting the UNFCCC objective, we conclude that a suite of additional approaches and technologies will be needed. To achieve the needed removal of carbon from the atmosphere-ocean system and to sufficiently offset incoming solar radiation, these capabilities must be deployable at the scale needed and with the rapidity required to reduce global warming with the most immediate start being made. Equally, the selection of these technologies needs to ensure that they can be utilized on a continuing basis until the human-induced addition to global radiative forcing is substantially reduced and be carried out in ways that minimize demands on future society, which is unfortunately likely to be preoccupied with addressing the challenges of climate change and associated impacts that today’s society has bequeathed them. ∙An essential action is to form a governing body, akin to the COP, to oversee a focused research programme to determine an optimal suite of technologies. It would be the responsibility of this group to conduct laboratory studies, field testing and model analyses to ensure efficacy, effectiveness and safety and to maintain an open and transparent interaction with the public and appropriate governance entities. Given the precarious state of the climate, the process of scaling up to an effective level will need to be done iteratively, especially in the case of approaches for solar climate intervention, taking advantage of what can and has been learned from studies of natural analogues that are similar in their actions as the proposed interventions. Taking too long to study and reduce supposed uncertainties in how to counter- balance the increasing warming will necessarily mean that the climate is moving further and further into states with which the world is unfamiliar and closer and closer to conditions that could lead to nonlinear growth of both climate change and its impacts. a.Counter-balancing the warming, often referred to as Solar Radiation Management (SRM), that aims to offset the human-induced warming by increasing the reflection of a small portion of solar radiation back into space, estimated in the region of 2W/m2 and considerably less than 1% of the total. b.Removal of CO2 from the atmosphere-ocean system, often referred to as Carbon Dioxide Removal (CDR), and, if possible, reduction of the atmospheric methane concentration via conversion of methane to CO2. c.Restoration of vital ecosystems, including soil, land cover, and wetland systems, especially in the tropics, the Arctic and along coastlines. ∙When done at sufficient scale, the interacting effects would likely be mutually supportive, such that the sum of the whole becomes greater than the sum of the parts. commitments. The most viable technical approaches are likely to be Marine Cloud Brightening (MCB) and stratospheric SO2 injection. Initial deployment in the Arctic regions during the summer to counterbalance the region’s amplified warming merits special attention as this is the region and season with the potential for intercepting very high amounts of solar radiation and for taking advantage of albedo feedback to amplify the effect. ∙Even in the event of a successful, large scale transition to zero carbon energy technologies, SRM would still be essential to replace the loss of aerosol cooling from sulphate particles that will occur as the use of coal is phased out. In this situation, SRM must be considered as complementary to attempts to decarbonise the global economy. ∙The decline in CO2 levels that were coincident with the Black Death and which has been related to the return of new forest growth, provides evidence of the carbon sequestration potential associated with returning denuded ground to new forest. ∙The focused use of biochar burial (i.e., burial of charred biological material) in marine wetland environments offers a promising approach to maximising carbon storage in soils. Further studies indicate that the potential of marine wetlands to sequester carbon can be signicantly enhanced by low level electrical stimulation of marine plants. 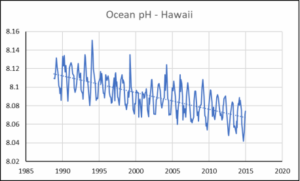 ∙Observations that ocean phytoplankton growth increases after the nutrification-enhancing effects of volcanoes and that the effects are evident in the Mauna Loa CO2 trend provides the basis for an approach to large-scale removal of atmospheric CO2. While the potential for iron enrichment is limited to certain, generally remote deep-sea regions, evidence suggests that dispersing buoyant nutrient flakes on the ocean surface in these nutrient poor regions will enhance marine productivity. Quantification of the rate of sequestration of carbon to the ocean sediments remains to be determined along with mechanisms by which this most optimally can happen. In a world facing increasing land pressures, then the likely increase in the availability of high quality marine protein to address the world’s food needs is an equally critical outcome from this intervention. The resulting phytoplankton blooms also may slightly increase the albedo of the ocean surface and even contribute to cloud seeding through their emission of dimethyl sulphide (DMS), thus providing an additional SRM benefit. Much, however, remains to be determined. ∙The COP targets currently assume CDR is achieved through BECCS and Direct Air Capture (DAC). However, a basic thermodynamic analysis of BECCS power plants shows that the final thermal efficiency is likely to be less than 8% and this is far too low to be economically viable for large-scale sequestration. Based on demonstrations to date, Direct Air Capture (DAC) techniques appear to be economically limited by their energy demand to development of net zero-carbon products such as transportation fuel that can be sold rather than for contributing to any significant reduction in the atmospheric CO2 concentration. Also, it seems quite improbable that either BECCS or DAC could be scaled up sufficiently quickly to limit global warming to below 1.50C, much less help pull the global average temperature back towards no more than 0.50C. Over the long-term, BECCS biomass requirements will cause conflict with the needs to achieve food security and conservation of pristine habitats; for DAC, there will need to be long-term proven storage capability and transformations in energy generation for it to become viable and solutions to these are unlikely to be found. ∙The limitations of the current economic model that incentivises fossil fuel driven economic growth must be addressed and an alternative found that incentivises aggressive mitigation while simultaneously making long term funds available for SRM and CDR (for geotherapy and ocean therapy approaches). This requires a price on carbon. ∙Carbon pricing and taxation can be achieved through international agreements. However, so far this has proven impossible to progress and despite the worsening outlook on climate change, there is no evidence of breakthrough. An alternative to this impasse is to use the insurance and reinsurance industries to price the increasing risk situation being faced using normal actuarial methods and deriving funds by imposing charges on the extraction of fossil fuels and other non-sustainable practices. It is also possible that the funds raised can be extended to cover climate change liabilities. As well as acting as a financial disincentive to fossil fuel production, this approach places the burden of liabilities fairly on those organisations that cause risk, rather than iniquitously on its victims. Under the Solvency II insurance regulations, it can be argued that there is a legal requirement for such a mechanism to be implemented by insurance companies. 5.1.1 The consequences of elevated CO2 and the challenges to reduction. 3.the rate at which excess CO2 can be removed from the atmosphere and oceans by either sequestration or conversion to biomass. Of these three factors, intergovernmental policy has focused primarily on the first. By contrast, there has been very little consideration given to (a) agreeing on the atmospheric CO2 concentration needed to meet the UNFCCC objective of avoiding “dangerous anthropogenic interference with the climate system” or (b) determining the rate at which excess CO2 can be removed from the atmosphere and ocean in order to accomplish a safe level and the limitations associated with this. 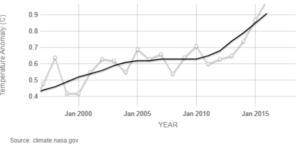 Despite the focus of climate change policy being almost exclusively on point 1 above, the global annual CO2 emission rate is now ∼60% higher than in 1992 when the COP process started. During this time, atmospheric CO2 concentration has increased from ∼350 ppm to over 405 ppm. Whilst the global response to rising temperatures and atmospheric CO2 has been mainly centered on attempts to reduce anthropogenic emissions in the highly industrialized nations, any resulting declines in emissions of CO2 and other greenhouse gases in these nations has been roughly balanced by the increases in emissions from nations with relatively low per capita emissions due to population growth and the need for more energy to raise the standard-of-living in these nations. This balancing of emissions is evident by the trend of fossil fuel consumption shown in the BP statistical review 2 in Figure 1. This shows that emissions have been relatively stable for the last three years, but the slight increase in 2016 suggests that even this stabilization may not be permanent. To have any realistic chance of maintaining the global temperature increase at less than the COP target of 1.5OC, global emissions of CO2 should already have been exhibiting a downwards trend; there is no indication that the world is on a path to accomplish this. Furthermore, the penetration of renewables into the primary energy productivity remains low, still at only ~2% of total energy production. Whilst the renewables penetration trend was initially exponential, over the past three years this has slowed to a linear penetration. This transformation reflects the increasing difficulty of continual expansion of the renewable infrastructure that is required and the challenge of replacing all fossil fuel derived energy applications, such as in transport, manufacturing and military. At the rate that has been evident for the past three years, it will take in the order of three centuries to transition to a zero-carbon economy, indicating much greater effort and incentives are necessary to accelerate the transition to a net-zero economy. 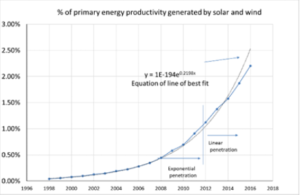 Figure 1 Data from BP Statistical Review showing penetration of renewables into primary energy productivity and overall anthropogenic emissions. The consequences of the failure to reduce anthropogenic emissions is clear in the Mauna Loa trend; Figure 2 shows that the rate of increase of the atmospheric CO2 concentration has consistently increased since detailed records began in 1958, rising by ~260% from approximately 0.7 ppm per annum in 1958 to 2.5 ppm per annum over the past decade. Increasing rates of loss of soil carbon from tropical forests, oxidation of thawing permafrost, and melting of methane clathrates in high latitudes strongly suggest that natural carbon feedbacks are being stimulated3, amplifying the existing warming influences of anthropogenic greenhouse gas emissions. The only time that the upward trend line of atmospheric CO2 significantly halted was following the Mount Pinatubo eruption, thus indicating potential avenues of restoration. The exact mechanisms that could have led to this include increased ocean phytoplankton growth due to the dispersal of an estimated 40,000 tonnes of iron into the planet’s oceans4, cooling of the ocean surface allowing higher CO2 absorption and globally increased vegetation growth due to more diffused light. Critical climatic and ecological measures are already evident in response to the nearly 50% increase in the atmospheric CO2 concentration and the ~1ºC increase in the global average temperature. As just some examples, Arctic sea ice thickness and extent have sharply decreased, endangering high latitude ecosystems; occurrences of extreme storms and heavy precipitation are increasing; heat stress is killing coral ecosystems through bleaching; ocean acidification is already impacting cold water ecosystems; the ranges of many flora and fauna are shifting upward and poleward, with large vegetated areas subject to killing pests and more intense wildfires; and the rates of sea level rise and coastal inundation are accelerating. This is happening before the climate system has equilibrated to the present atmospheric concentrations of greenhouse gases, especially given that the sulfate cooling offset will be quickly lost as emissions from use of coal are phased out. 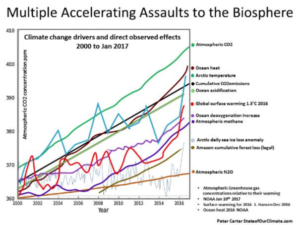 Serious and very impactful responses of the climate system and its ecosystems to increases in the atmospheric CO2 concentration started well before the sharp and persistent increases in atmospheric temperatures that have characterized trends over the past 30 years. With the climate system, a critical 15% loss of Arctic sea ice thickness was observed between 1976 and 1987 by Wadhams5, indicating that Arctic amplification was already well underway. With the ecosystem, bleaching of the coral reefs due to heat related stress was observed as early as 1983 by Goreau6. In 1980, at the approximate time when these changes were happening, atmospheric CO2 was at 336 ppm. The history of the intensification of climate change impacts makes clear that a sustained atmospheric temperature rise of even 1ºC, much less the 1.5 to 20C temperature rise (and quite likely overshoot) that the provisions of and commitments to the Paris Accord are envisioning, would be well beyond the “dangerous anthropogenic interference” provision in the UNFCCC. Even the much less onerous carbon budget of 500 GtCO2 emissions set by the IPCC AR5  to give a 50% chance of avoiding a 1.50C temperature increase is unachievable against the current political background given that today’s annual emissions are 34GtCO2 and will lead to the budget being exceeded by approximately 2026. The severity of these risks has been highlighted with the first three months of 2017 recording an average temperature increase of 1.480C above the pre-industrial base line of 1881-1910, which is the earliest date for which global temperature data are considered reliable8. Whilst the focus of intergovernmental climate change targets has been on stabilizing temperature and reducing anthropogenic CO2 emissions, there are no equivalent intergovernmental targets or aspirations on the equally dangerous change which is occurring with ocean acidification or sea level rises. Because CO2 solubility is inversely proportional to temperature, the consequence of acidification is a far more serious problem in cold water and for deep ocean organisms. Thus, the consequences will be first seen in the Polar Regions with significant losses of the phytoplankton at the base of the marine food chain. Along with this will be the degradation of the ocean’s ability to sequester atmospheric CO2, see Figure 4. For sea level rise, the situation is even more threatening. Analyses of paleoclimate records from the most recent deglaciation and from much more distant periods that were 4–60C warmer than present, suggest that the sensitivity of sea level to changes in global average temperature must be roughly 10– 20 m per degree Celsius. While the response time for the ice loss to occur is not well understood, it is not implausible that the rate of future sea level rise could reach a few meters per century as ice sheets collapse rather than melt9 and similar rapid sea level rises have characterized paleoclimate records10. Such a situation could persist for many centuries, even in the hypothetical circumstance of anthropogenic CO2 emissions falling to zero before 2100. The essence of the 2015 Paris Agreement [UN Framework Convention on Climate Change (UNFCCC), 2015] was increasing international recognition that climate change has already started to have serious impacts, that substantial further impacts lie ahead, and that efforts to reduce CO2 and other greenhouse gas emissions must be urgently undertaken. Indeed, the Paris Agreement committed the signatories ‘to achieve a balance between anthropogenic emissions by sources and removals by sinks of greenhouse gases in the second half of this century’. Given the current dangerously high level of CO2, the rate of change of temperature and the minimal rate at which CO2 is being sequestered, then it is impossible to achieve this in a timeframe that can be deemed safe. 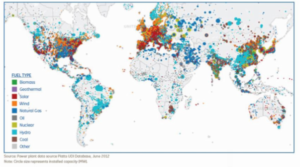 To do so requires the fossil fuels which presently provide ∼80% of the world’s energy to be replaced in their entirety with renewable or nuclear sources against a background of increasing energy demand for services such as transportation, agriculture, manufacturing and military infrastructure in developing nations. For this transformation to take place, unprecedented levels of international co-operation are needed at a time of heightening competitive rivalries which are exacerbated by climate change. This fundamental paradox of climate change makes the near complete transformation of the global energy system to a net zero carbon economy a virtual impossibility within the timeframes available. This is explored in detail in Appendix 3 which concludes that agreements of the type needed cannot be made unless far reaching security agreements are linked to progress with climate change. In the absence of such far reaching agreements, the most optimistic analyses, based on the current national commitments and along with the untested assumption that a successful global roll-out of Bio Energy Carbon Capture and Storage (BECSS) can sequester significant atmospheric CO2, project a warming of roughly 3–3.50C by 210011. This indicates that considerably greater reductions in emissions, including achieving negative emissions of CO2 over prolonged periods of many decades and most likely many centuries, will be needed to bring long-term warming below the targeted ceiling of 1.5 to 20C above preindustrial temperatures. Future planetary temperature increases, which are now locked in, will not be uniform and will be far more pronounced in the middle of the continents away from the moderating influence of oceans. This is where the main food producing regions for staple crops such as wheat, corn and maize are. Once temperatures in these regions reach a threshold of approximately 40OC, a temperature which many are now experiencing, photosynthesis stops and food production ceases. Simultaneous with this, is the loss of agricultural land from sea level rises, [King et al 2015]12. These direct effects on food supply, along with loss of critical infrastructure [Bank of England, PRA review]13, will cause crippling impacts to the global economy and fuel political instability. The subsequent disruption will increase the difficulty associated with agreeing to climate change action and will occur simultaneously with the rising carbon emissions associated with adaptation efforts, thus further stressing the remaining the carbon budgets. Despite warming and disruption intensifying more rapidly than expected and the international community moving away from fossil fuels more slowly than needed, no significant change in policy has emerged in recognition of this. The only response has been the most modest increase in research to understand the potential for undertaking global-scale climate intervention, and most of this remains largely exploratory with virtually no focus on practical implementation, no consideration of synergistic effects, no consideration of the time scales for intervention and no consideration of the economic and political models that are necessary to support deployment in the long term while simultaneously curtailing fossil fuel use. Consequently, there has been no effective high-level interest among international decision-makers in organizing a mission-focused climate intervention research and deployment program aimed at preventing the global average temperature increase from exceeding the 1.5 to 2.00C, which will lead to severe consequences [e.g., Hansen et al., 2016]. Nor has there been any movement toward the even larger global intervention that would be needed to slow and then halt the rise in sea level, which may soon be on a path that will, over a longer term, inundate the world’s coastal cities, productive deltas and wetlands and vulnerable infrastructure such as ports and nuclear power facilities. Instead, debates about global climate intervention are often silenced with contradictory and unfounded assertions, or they are used to relegate climate intervention to a potential emergency response that could be resorted to some decades in the future as a possible remedy after substantial impacts are widely evident and the consequences are becoming unacceptable. These positions fail to acknowledge that unless global climate intervention is started in the near term and augmented with the intent of pushing the climate system back toward mid-20th century conditions at which a position of climatic stability can be found, there is the possibility that the research to better understand the potential for global climate intervention will ultimately go unused. This is despite the increasing evidence that a return to these relatively recent conditions is essential for the long-term survival for most of the world’s people and the continuance of society. The compounding problem is the scale of the intervention and the complexity of finding a viable economic model increases with the delay. The risk assessment by King et al12 warns of a systemic collapse due to simultaneous climate change effects such as the loss of industrial and agricultural land due to sea level rises and increased storm intensity, crop failures and massive increases in environmentally driven migration. In domino fashion, the ecological collapse would trigger an economic collapse which would trigger a political collapse. In the ensuing chaos, with funding and organization absent, the kind of large scale climate stabilizing program needed would be beyond the economic reach of countries, and the situation would be exacerbated as countries would be forced to value short term survival and competitive advantage over long term co-operation for environmental protection. In contrast to this scenario, research has indicated that increasingly planetary albedo through low risk, marine cloud brightening14 or the higher risk approach of augmenting the stratospheric aerosol concentration using stratospheric SO2 injection could substantially cancel out the increase in global heating caused by a doubling of atmospheric CO2 from preindustrial levels. Furthermore, marine cloud brightening offers broad-scale changes in precipitation over many regions of the world [Tilmes et al., 2013; NRC, 2015b; Irvine et al., 2016; Latham et al, 201415], such that dry regions receive more rainfall and wet regions receive less rainfall. As well as no international debate on pursuing these critical programs, there is also no debate to establish how a delayed intervention will increase the likelihood that that the detrimental changes to the ecosystem will become irreversible. Thus, while scientific and technological questions that merit additional research [MacMartin et al., 2016] languish, and while governmental efforts are needed to develop appropriate governance mechanisms for deciding how to optimally intervene, putting off initiation of climate intervention until there is a much greater perceived understanding risks the situation where the intervention needed to restore the planet’s milder conditions may be unacceptably disruptive and ineffective. Recognizing that the most effective technical approaches to actual intervention generally mimic natural influences and processes that have been studied, it might well be that the uncertainties and consequences (both intended and unintended) associated with gradually intensifying global intervention, starting in the near term, would be less serious than the uncertainties and consequences associated with either not intervening at all or with waiting until impacts are substantial and intervention is viewed as the only remaining option for preventing global catastrophe, especially when the irreversibility of climate change is factored in. Given that recent measurements indicate extremely rapid changes are already taking place in the climate system, then the luxury of time to confirm these assertions using the traditional scientific hypothesis-testing framework is not available. In addition, most of the ethical analyses against climate intervention have been primarily focused on evaluating the relative risks and benefits of climate intervention on its own, without inclusion of the existential risks associated with the projected changes to the climate without intervention. Thus, conflating climate restoration with the hubristic ideas of the mid-20th century when unfounded geoengineering ideas were proposed as a means of improving the climate to enhance agriculture and living standards or by overstating the potential of renewable technologies to replace fossil fuels, transfers an unacceptable moral hazard to future generations by delaying the immediate start that is needed for a climate restoration program. 5.2 Where do we want to go? 5.2.1 A Potential Approach: An intervention strategy focusing intervention on points of climate amplification. 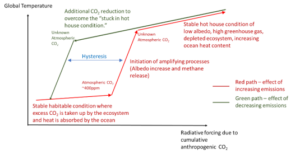 A largely unexplored avenue of action to achieve the Paris goals of limiting temperature to 1.5OC is to simultaneously target the critical points of change which, if left unaddressed, will lead to future amplification of climate change, but conversely if addressed systemically can lead to increased mitigation of climate change through the synergistic effects of their outcomes where each one reinforces the others. 3.the release of methane from the Arctic regions. The notion is that targeted interventions towards these critical points might be able to moderate the worst impacts, but this is on the proviso that they are implemented at industrial scale before points of irreversibility are past. While such efforts might be viewed as providing a bit more time for global emissions reductions, delays in reducing emissions would lengthen the time needed for such interventions to be effective, increase the scale of these and potentially overwhelm their effectiveness. Thus, in no way can the proposals developed in this paper ever be considered as an alternative to cutting CO2 emissions. Three types of intervention are needed, these being (1) solar radiation management which is aimed at cooling the planet and restoring the radiative balance; (2) sequestration which is aimed at removing CO2 and methane gases from the atmosphere and (3) restoration of ecosystems which are now facing fundamental, amplifying change, such as the Arctic and coral reef systems. The starting point of a climate restoration strategy is to determine what the target must be to achieve a reasonable degree of confidence that successful stabilization of the climate change can be achieved. From this, order of magnitude estimates of the scale, cost and timeframe can be established along with the interactions of these; for example, if a climate intervention is delayed or started on an insufficient scale then the speed and scale of the final intervention must be correspondingly increased. One of the most instructive data sources for determining an answer is Vostok Ice Core data which provides atmospheric CO2 and temperature values over a 600,000-year period17. 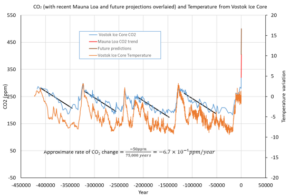 This is plotted in Figure 5 and it shows the close coupling that exists between atmospheric CO2 and temperature. This coupling comes about through a rise in atmospheric CO2, such as through volcanic activity, causing temperature rises or alternatively an initial temperature rise, such as from Milankovitch cycles18 causing a subsequent rise in atmospheric CO2 through reduced CO2 uptake by the oceans which then acts to amplify the initial temperature increase. These amplifying mechanisms, and others, increase the sensitivity to change. To be able to overcome these, a strong stabilization forcing is required, and this is mostly provided by the action of biological homeostasis sequestering CO2 which consequently returns the environment from a hot condition to a stable, cool condition. This was conceptually illustrated by Lovelock et al 19 with the Daisy World model which offered an analogue of the stabilizing mechanisms that operate in the climate system by considering a hypothetical planet where the temperature was controlled by the resulting balance of albedo achieved from black and white daisies. With the survival advantage going to white daises in warm periods, the albedo of the planet increased as they spread and cooled it cooled it down, thus the offsetting of the additional heat from a warming sun. The same effect is evident on the Vostok ice core data. During warm periods, plant life increases, and CO2 reduces which returns the planet’s temperature back to cooler conditions. Crucially, Lovelock’s Daisy World model demonstrated that once global temperature starts to rise, it indicates that control has been lost and a nonlinear step change can occur with the temperature diverging uncontrollably from its previous equilibrium state that supported life to a new hot-house state that doesn’t. This instability is a typical characteristic of closed loop control systems, such as the planet, whereby if the planet heats up beyond a certain level then biomass dies, and instead of sequestering CO2 to reduce temperature, further CO2 is released to increase the temperature. Hence, while the Vostok ice core data shows that assumptions of controllability are valid up to 300ppm, in that the planet’s temperature can stabilize by returning to a lower temperature after an increase, the corollary of this is that there is no evidence to suggest that the same control mechanisms that provided stability in the past can operate at the significantly higher CO2 levels of today and at the higher rates of change of CO2. As a demonstration of how far the climate system has moved, and is moving, from the previous stable regions, a projection of a 500ppm atmosphere is superimposed on the Vostok data. Critically, the Vostok ice core data shows a remarkably consistent saw tooth profile where CO2 can increase quickly, but the subsequent decrease and return to a stable condition takes place on a period that is orders of magnitude greater than the initial impulse, with a typical recovery rate over the past four cycles of ~0.00067ppm/year. Thus, in the hypothetical scenario that the planet was able to naturally recover from the current spike induced in the CO2 profile, it would take approximately 250,000 years for emissions to return to an upper pre-industrial level of 280ppm. Even at this level, it would still represent a warm condition for the planet and not a true recovery to stability. Paleoclimate data suggests that more rapid rates of recovery are only possible by killing the ocean, whereby high temperature and rotting marine life removes oxygen from the seas, turning the ocean into a dead zone and polluted with hydrogen sulfide. Organic matter then piles up in deep ocean sediments, eventually removing the excess CO2 from the atmosphere. The extremely slow sequestration rate of CO2 compared to its rapid release is entirely consistent with the concept underpinned by the second law of thermodynamics, which is that all systems tend to move towards a state of maximum entropy and an atmosphere with high greenhouse gas levels is the high entropy state that the planet’s climate system will always be attracted towards. So, in the same way that energy is stored in a spring when it is compressed, the planet stores solar energy and reduces entropy by converting CO2 into fossil fuels and chalk. These processes require two steps. Firstly, plant life converts CO2 to carbohydrates within the biomass and secondly, CO2 is permanently sequestered by converting that biomass to chalks or fossil fuels. The secondary mechanisms, that provide the permanent sequestration, require additional energy input. So, with shell formation, this is provided by the energy stored in the biomass and this releases one mole of CO2 back to the environment for every mole of calcium carbonate deposited. It is this unavoidable inefficiency that provides an upper limit to the rate at which natural processes can sequester CO2 from the environment. By contrast the energy stored in fossil fuels can be released instantaneously through combustion which restores the planet back to a high entropy state. In 2008, Hansen et al. proposed that an upper safe level of atmospheric CO2 was 350ppm, and this became widely accepted as an aspirational target to avoid the catastrophic climate change that would result through the slow feedback responses of ice loss and methane release. It came with the caution that the actual level could be lower20 and this concurs with the fact that 350ppm was still considerably higher than anything seen on the Vostok ice core. Their paper postulated that if the globe warms much further, then carbon cycle models21 and empirical data22 were revealing a positive GHG feedback on century to millennia time scales23. These warnings are now being realized. However, in 2008 when Hansen’s paper was published, atmospheric CO2 was as at 385ppm, the Arctic still had stable multi-year ice and atmospheric methane levels had stabilized after prolonged increases since the 1980s, thus conditions then had not moved too far from those necessary to ensure stability and reversibility might still have been possible with a modest climate intervention strategy. Since then, each of these critical measurements have moved, lockstep together, towards worst case positions, or beyond them. The result is that the amplifying mechanisms that were once thought to be slow, such as sea ice melt, have been replaced fast ones such as ice collapse25 and all changes are now mutually reinforcing. A further example is that melting of offshore permafrost has removed the physical barriers that once prevented or slowed methane on Arctic shelves from escaping to the atmosphere and now allows arterial routes from the methane sources to the atmosphere which were not anticipated in Hansen’s earlier study. Now that the many caveats that were placed on the 350ppm target have been realized, the reasonable supposition is that a far lower CO2 target is needed with a corresponding far greater removal of CO2 from the atmosphere being necessary. The result of the interacting changes is that Arctic sea ice extent and volume are now falling below their lowest ever levels while methane levels and Arctic temperatures are rising above their highest ever levels. The near total absence of multi-year ice26 as of this year (2018) presents the danger that the Arctic Ocean will be ice free during the critical May to July period when the sun is at its highest as soon as next year, 201925, or at best only a few years thereafter. Once this happens, the rate of heat absorption by the ocean increases considerably as the albedo changes from as high as 0.9 for snow covered ice to as low as 0.06 for open ocean27. Pistone’s analysis  of the decrease in sea ice during 1979-2011 showed it caused a total global radiative forcing (i.e., a heating) that was 25% as large as the radiative forcing from CO2 emitted during 1979-201128. A crude extrapolation of this implies that the complete loss of the Arctic sea ice over the summer period would cause a radiative forcing that is 62.5% of the average radiative forcing from anthropogenic CO2 during the period 1979- 2011. Given the planet was already in an energy imbalance during this period, as evidenced by the melting sea ice, then this additional heat input is entirely unsustainable. Furthermore, Wadhams (2016) has noted that the radiative forcing effect is roughly double that calculated by Pistone et al. because there is also an albedo feedback with the rapidly retreating Northern Hemisphere snowline. 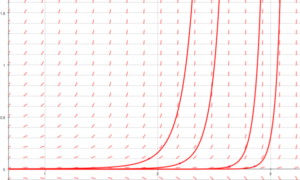 Should this be the case, the basic shape of output will be as in Figure 7 which shows a family of super exponential functions with different values of α and β. The vital characteristic of this type of function is that once the value starts changing, it rapidly gains speed and a step change happens where the profile of the change is largely the same, irrespective of the starting conditions or the values of &alpha; and &beta; that are chosen. Thus, the temperature will increase until a new thermal equilibrium is found. With the climate system, there will of course be some moderation of the final temperature change due to thermal inertia in the ocean, but the tendency will always be towards very rapid change and this is more fully discussed in Appendix 2. Rising methane emissions that are a key influenced of this amplification process have a lifetime in the atmosphere of only 12.4 years29 before oxidation into CO2. 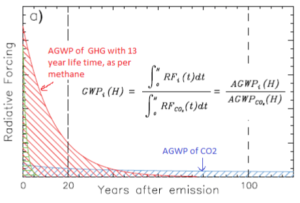 Consequently, most of the heating effect of a single pulse of methane is concentrated in the first years of release, as illustrated in Figure 8 which compares the Actual Global Warming Potential (AGWP) of methane with the long term, but lower intensity, AGWP of an equivalent volume of CO2. 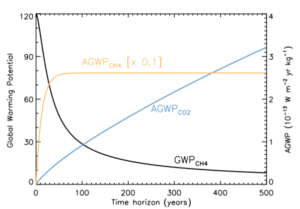 For a given time after a pulse release, the cumulative AGWP due to the methane is divided by the cumulative AGWP due to the equivalent volume of CO2 to give the Global Warming Potential (GWP). This process allows normalization of other greenhouse gases with CO2. For Kyoto I, the time selected for normalization was arbitrarily chosen to be 100 years which gave a GWP for methane of 2131. However, there was no scientific rationale for choosing 100 years and this factor would only be appropriate if it was envisioned that methane would be released as a single pulse and the climate was still relatively stable over a longer period, perhaps several hundred years. However, neither of these two assumptions pertain to today’s conditions. Firstly, the level of methane in the atmosphere is increasing, which approximates to increasing methane pulses being added each year and which introduces an annual perturbation to the planet’s radiative budget due to the immediate and extreme short-term heating effect of methane. Therefore, under the current condition of increasing methane levels, the GWP of methane should be considered over a timeframe as short as a single year, giving a value of 120 times that of CO2, as determined by the IPCC data extract Figure 9. Secondly, this higher GWP now is more able to support the super exponential change in the Arctic, thus negating the assumption of a relatively stable climate. Now that the physical ice barriers are largely absent, then methane releases to the atmosphere will occur equally in the winter to the summer which leads to further amplifying mechanisms that increase the GWP of methane due to seasonal effects. Firstly, the lack of sunlight in the winter months prevents the methane that is released during this period oxidizing to CO2 which allows methane to accumulate in the atmosphere over the winter months. This delay to oxidation has the effect of translating the curve in Figure 9 to the right by at least three months, which significantly increases the area under the curve due to its exponential nature while also increasing its height due to higher equivalent concentrations in the atmosphere. Secondly, there is an additional effect due to the higher concentrations of methane persisting during the Arctic winter which is the time and place where the maximum heat flows from the planet to space as black body radiation over a 24-hour period. Finally, as the concentration of methane increases, it will stay in the atmosphere longer due to the hydroxyl molecules in the atmosphere that would normally reduce methane to CO2 becoming saturated. This has the effect of stretching the GWPCH4 curve of Figure 9 to the right. Given the analysis of Appendix 2 which argues that the interactions between amplification mechanisms greatly accelerates the change and the result will be the simple aggregate of the maximas, then these factors that can combine to translate and stretch the methane GWP curve can act to bring forward the time when a sudden change in conditions occurs. Thus, the fact that Arctic temperature, ice melt and methane levels are all simultaneously accelerating is an extremely worrisome observation and the only logical conclusion is the conditions that exist now are conducive to a super exponential step change, and that it is already underway. Furthermore, our lack of knowledge of the size of the methane reservoirs prevents us from knowing the final outcome conditions and equilibrium temperature. The sizes of the methane reservoirs that are at risk due to activation by warming are essentially comprise biogenically produced methane, land-based permafrost trapped methane and subsea clathrates. Of these, the biogenically produced methane is the first source to be activated and the last to be activated will most likely be the subsea clathrates, for which there is a delay as heat diffuses through the seabed to release the frozen plugs of methane that sit at the top of the methane reservoirs. However, this last process is likely to be considerably speeded up as most of the at-risk subsea methane is in relatively shallow water which is where most of the ocean heat content accumulatres33. A further piece of critical physics that determines the long-term transient response of the earth to the impulse of greenhouse gas releases is the uptake of heat in the oceans and the time constant for this (the time taken to achieve a 63% of the final stable temperature) has been long debated, with estimates ranging from 30 to 300 years. Glecker  concludes, “Our model-based analysis suggests that nearly half of the industrial-era increases in global Ocean Heat Content (OHC) have occurred in recent decades, with over a third of the accumulated heat occurring below 700m and steadily rising.”34 By comparison with the estimates for the temperature time constant, is the reality that approximately half of the anthropogenic CO2 has been emitted since 1990 (BP statistics review2). Thus, even without the complicating effects of short-term tipping points, there is still significant heating already in the pipeline just from the legacy CO2 that has been injected into the atmosphere over the past 30 years, irrespective of a high or low estimate being used for the time constant. Whilst the rise in atmospheric CO2 since preindustrial times has caused significant direct heating, subsequent emissions will cause less direct heating due to the logarithmic relationship between atmospheric CO2 and heat absorption. 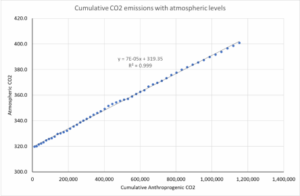 This is driven by the equation: with C being the current level of CO2 (i.e. 405ppm) and C0 the preindustrial reference level (250ppm)35 and ∝ being a scaling constant. This fundamental relationship between heat absorption and CO2 concentration has formed the basis of every climate change model since it was established experimentally by John Tyndall in 185636. However, this relationship is not immediately apparent in the outputs from climate change models or from observed temperature change. The output from climate change models shows a mostly linear relationship between cumulative CO2 emissions and predicted temperature rises rather than a flattening logarithmic curve, see Figure 10 with the difference between the two being due to the enhancing effects such as albedo changes, vapor cycles, changes to the carbon cycle and cloud effects, all of which amplify the initial heating. The difference between the theoretical logarithmic absorption curve and observed temperature changes is even worse. Since 2010, the observed temperature trend, see Figure 11, has substantially changed in form with the normal year to year variance being replaced by a smooth exponential trend indicating that climate forcing agents, rather that direct heating effects from CO2, are now dominating temperature changes. The uniqueness of the profile during this period is indicated by comparison with the past data trend which shows no single comparable period to have such a consistent unidirectional pattern of year-on-year temperature rises. Figure 11 Observed Temperature changes with a 5-year moving average overlaid38. While the spikes in temperature during 2015 and 2016 have been attributed to El Nino39, this overlooks that the frequency and intensity of El Nino events have dramatically increased since pre- industrial times when they were on a frequency measured in hundreds of years40, and thus the latter sharp rises in the temperatures are most likely signs of an underlying trend rather than a short term aberration. 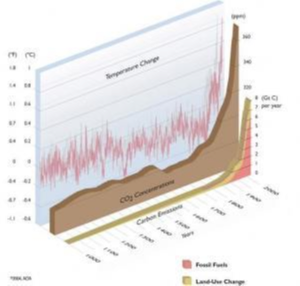 Thus, in the immediate short term (circa 10 years), the future heating of the planet will be dominated by the amplifying effects of methane releases, loss of albedo and the heating that is already in the pipeline but delayed due to the heat sink effect of the oceans, rather than that caused by additional anthropogenic CO2 emissions and this is evident in the graphs of Appendix 2. While the logarithmic relationship between temperature and atmospheric CO2 minimizes the future direct heat forcing due to further the cumulative build-up of CO2 that will result from current international commitments to climate change, the flipside is that even if anthropogenic emissions can be brought to zero at some future point and CO2 removed from the atmosphere, then the cooling effect will be unable to counter the amplifying effects that have already been unleashed by the initial warming. To put this in perspective, a 50ppm increase in atmospheric CO2 at the beginning of the industrial revolution which took levels from 250ppm to 300ppm creates a direct radiative forcing increase that is approximately 35% greater than the direct radiative forcing reduction due to a 50ppm reduction if atmospheric CO2 was reduced in the future from 450ppm (the level expected by 2030) to 400ppm. This means should there be a reduction in atmospheric levels in the future, it is most unlikely that it will be able to counter the heating effects of the amplifying processes that have been instigated. In this context, the initial change of atmospheric CO2 has acted like the trigger of a gun and has created a situation that is now effectively irreversible, unless there is direct and substantial climate intervention that must initially focus on cooling to restore the radiative balance. At best, given the rate of atmospheric CO2 reduction evident from the Vostok Ice Core, it will take hundreds of thousands of years for CO2 levels to fall sufficiently to cool the planet without human intervention. Irreversibility is a general feature of all closed loop feedback systems as they move from one initial state to another and are then transitioned back to the initial state; it is commonly known as hysteresis. 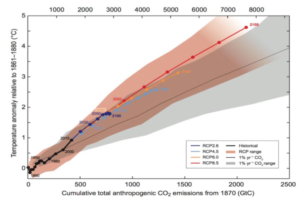 Its application to the planet’s system is conceptually illustrated in Figure 12 where the red line is the temperature profile resulting from cumulative anthropogenic CO2 emissions which causes the planet to transition from the pre-industrial stable state of low CO2 and high albedo (due to ice and snow cover) to a new, hot-house stable state of high CO2 and low albedo. The green line is the hypothetical temperature profile that would occur if atmospheric CO2 is reduced, forcing the planet from a hot- house state back to the pre-industrial state. The width of the loop formed by the temperatures going in the opposite direction, is a measure of hysteresis in the system. Although studies have been conducted on the hysteresis loops associated with changes of individual components of the climate system, such as melting of Arctic Ice cap41 and reduction of the Atlantic Meridional Overturning Current (AMOC),42 there is no comprehensive analysis of hysteresis on the planet’s climate system which considers the combined effects of all forms of irreversibility and discussion of this is absent in the IPCC reports. Consequently, its implications have been largely ignored from climate change policy and debate, despite its profundity. The resulting area of the hysteresis loop will be a function of both the temperature increase and the time that the planet remains at a higher temperature. This raises the fundamental question of where the planet is placed on the upwards trajectory of this loop. Given that rapid temperature rises are already being observed, then it most likely that we are already on the fast up-slope, that hysteresis has already built up to significant levels in the climate system, and that the width of the loop is dangerously widening. 1.Atmospheric CO2 must fall to well below pre-industrial levels of 280 ppm and remain at these levels for prolonged periods to offset the heating caused by the reduction of albedo and methane increases. 2.The best possible natural sequestration rate, which can be established from the Vostok Ice core data, would indicate that it will take in the order of 250,000 years for CO2 to return to pre- industrial levels and this is too slow to allow a recovery from the trend of elevating temperature. 3.As well as being driven by the changes to the ecosystem, the width of the hysteresis curve is driven by basic physics, such as the heat trapped in the ocean and the unique logarithmic relation between atmospheric CO2 and radiative forcing which exacerbates the problem further. 4.The final target temperature rise must be as close to zero as possible and certainly no more than 0.50C, which is the level at which serious changes to coral and sea ice were first observed. Thus, attempting to limit temperature rises to 1.50C, as per the COP21 agreement, represents an intolerable level of risk. 5.The only way that the hysteresis loop can be narrowed is through Solar Radiation Management, but there will be a point in time when attempts to cool the planet using SRM will be overwhelmed by the additional and mutually reinforcing amplifying processes. Priority 1 is to reduce solar radiation on a sufficient scale to enable cooling of the planet using its relatively short time constant in the hope that it can reverse and stabilize the uncontrollable heating that is now manifesting itself in the Arctic and elsewhere in the planet. If the situation becomes more extreme, the scale of the intervention can be temporarily increased then subsequently scaled back to a long-term level of intervention. In effect, the scale of the intervention would be proportional to the error from the stable preindustrial era and the derivative of the temperature43. Priority 2 is to pursue techniques for Carbon Dioxide Removal (CDR) and the removal of methane. These should be pursued in parallel to the solar radiation management but done in the expectation that their effects will take longer. The techniques adopted for CDR should be selected to give the fastest possible reduction in CO2 in the atmosphere and oceans, with the minimum risk of the sequestered carbon returning to the atmosphere. Return of atmospheric methane to preindustrial levels can probably only be achieved by the photocatalytic breakdown of methane into less harmful CO2. Priority 3 is to restore the Arctic sea ice, potentially through a program of ice thickening whereby sea water is pumped onto the surface of the ice sheet causing it to thicken. The arguments presented in the preceding section preclude the expectation that an effective intervention can be made in a period that can be measured in just a few decades. Instead at best, any intervention will most likely have to be sustained for many centuries, most likely for millennia. These interventions must also be capable of being sustained in the event of the large scale ecological, economic and political turmoil as described by King’s risk assessment12. 1.It should be immediately scalable following validation and be economically viable to do so. 2.It should use the minimal amount of high technology and complex processes in both the field equipment and manufacturing. 3.It should require the minimal use of fossil fuels for energy. 4.It should be able to operate with the only a model level of logistic support. 5.It should have minimal adverse side effects and where there are side effects, these must be known, acceptable and controllable. 5.3 How do we get there? The following sections gives a brief overview of climate restoration techniques. It is not to be considered as a comprehensive assessment, instead it focuses on those intervention techniques that can most feasibly comply with the objectives of the preceding section 5.2.3 or have been proposed as being necessary to meet the COP21 targets. The objective of SRM is to stabilize the planet’s energy imbalance by reducing heat flow to the surface of the planet either by increasing reflectivity (albedo) or reducing insulation to allow greater heat flow back to space. Prospective proposals to achieve these objectives are emerging. The focus of this paper is on those approaches that have the potential to cause notable cooling when deployed on a large scale, rather than the more small-scale, localized albedo enhancements, such as whitening of roof tops and road surfaces44, other than to note the cumulative effect of these can be significant and that the detractors of solar radiation management have been silent on these initiatives. As 95% of the heat absorbed through the build of CO2 is trapped in the oceans, then returning the oceans to a thermally stable state that is compatible with the critical ecosystems such as corals and phytoplankton populations is the ultimate measure of success of any SRM program. Consequently, the scale of an SRM program and the time with which it must operate will be determined by the rate at which it allows heat to flow from the ocean, into the atmosphere and out into space. The required cooling of the oceans is a human endeavor without precedence and little research has been conducted on this, yet detailed consideration of the resulting heat flow from the ocean to the atmosphere is critical to determining both the scale of an SRM program and timeframe for which it must remain operational. The anticipated mechanisms that will contribute to the heat flow are micro level vertical turbulence, which is where cool surface water sinks and is replaced to by warmer water from below, largescale release where storms bring up warm water to the surface and finally macro scale release which is driven by mechanisms such as the AMOC. The contribution that each of these mechanisms makes to heat transfer from the ocean to the atmosphere will be dependent on many factors, not least of which is the current level of warming and the resulting stratification of the oceans it causes. Marine Cloud Brightening (MCB) involves the injection of seawater or brine aerosols with a diameter of approximately 0.8 microns into the lower levels of the troposphere. These aerosols are either released at cloud making altitude, or if released lower, rise into the clouds by turbulence and thermals and act as cloud condensation nuclei (CCN) particles. Global cooling comes principally from two mechanisms, the Twomey45 effect and the Albrecht effect46. Both are well established and verified from laboratory testing and physical observations. A key aspect of this approach is that its use is limited to dispersing salt water which replicates natural processes, thus no additional chemicals are being introduced to the environment, making it politically and socially acceptable and potentially even more benign than attempts at roof and road whitening which require inputs of paint and other chemicals. There is little risk of salt contamination on land as most salt spray will be washed out in mid ocean before the air mass comes ashore, so it will not add much to the salt that is normally deposited inland from waves breaking on beaches. If salt falls anywhere else due to rainfall, it will be washed down rivers back to sea. If it falls in arid regions such as South Australia or Saudi Arabia where already large amounts of salt have deposited over hundreds of years the small addition from MCB will not make soil salinity appreciably worse. With the Twomey effect, a large quantity of small drops of a substance reflect more light and energy than when the same mass is divided into a smaller number of large drops. This finding is replicated glass balls in Figure 1347. 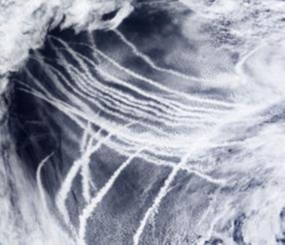 On a larger scale, this is visible with satellite photographs of cloud enhancement due to particles in the exhaust gases from ships as in Figure 14. With the Albrecht effect, precipitation from clouds is delayed by the smaller droplet size that results from the increased number of CCN particles, thus increasing the cloud lifetime and its effective optical depth. Although computer simulations show that effective deployment of MCB can offset the direct heat effect of a doubling of the atmospheric CO2 over preindustrial levels,14,15 it is not certain that it can offset the additional heat from the combined effects of albedo loss and methane release. These limitations will become more profound as Ocean Heat Content (OHC) increases with time, hence the importance of starting immediate development and early deployment tests. Because of the Albrecht effect, large scale MCB offers the prospect of restoring precipitation patterns back towards pre-industrial conditions and even of bringing additional rainfall to deserts. 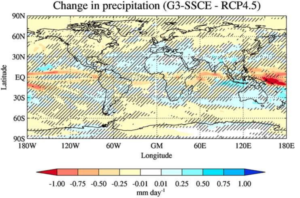 The delayed precipitation results in less rainfall over ocean regions and prospectively more in areas such as the Horn of Africa48, see Figure 15. Parkes (2012)49 has also shown how carefully targeted MCB can deliver desirable precipitation changes on the other side of the world. As well as being critical to food production, the ability to manage rainfall through targeted MCB deployment is likely to be equally critical to land based methods of carbon dioxide removal such as afforestation which requires regular rainfall to prevent the risk of fire and to maintain optimal growing conditions. The final piece of physics is from Köhler50. He showed that getting a relative humidity of 100% is not sufficient for droplet formation. For this to happen, starting seeds are necessary along with a small excess of relative humidity above 100%. The levels of condensation nuclei in the air over land ranges from 1,000 to 5,000 in a cubic centimeter, but in the cleaner air over mid-ocean this can be as low as 1014. Consequently, without atmospheric seawater or brine injection, water vapor remains in the air longer which, being a greenhouse gas, whose concentration increases as temperature increases, causes further amplification of global warming. Without field experiments, it is not possible to determine how long the effect of sea salt spraying will last nor the variables that will influence its effect, but it is a reasonable estimate that it will be in the order of 1 to 2 weeks51 and will be dependent on weather conditions before washout occurs. This means that should any detrimental effects become evident, the process can be switched off and a return to pre-spray conditions can quickly be achieved. The counter to this is that to sustain long term cooling, then seawater spraying must be done continuously which demands the most energy efficient methods of spray production, the most reliable methods and, where possible, power from renewable or low carbon sources such as wind. In the Arctic, MCB can be deployed in the May to July period to protect the ice sheet from direct solar heating if there is supersaturated air (though the salt aerosols will have some beneficial cooling effect on their own, without nucleation). During this time, MCB is enhanced by the heat flow over a 24-hour period averaging 550 Watts per square meter due to the 24-hour exposure to the sun compared with the average 440 Watts per square meter over a 24-hour period in the equatorial regions. However, deployment of MCB in lower latitudes still reduces the heat flow that is transferred to the Polar Regions and can be continued year-round. Modelling demonstrates that deployment in these lower latitude regions provides sufficient cooling over a long time to help re-establish ice thickness at the North Pole and the cooling will also help stabilize permafrost. Also, of absolute criticality is the need to minimize heat flow into the ocean surface of the subtropics to prevent or minimize the formation of hurricanes. Various methods have been proposed for generating and disseminating the aerosols53. Salter has proposed pumping sea water through billions of submicron nozzles etched in silicon wafers which operate like the nozzles of an ink jet printer with regular back flushing to avoid contamination build up. These would be located on remotely controlled and autonomous vessels. Armand Neukermans et al. have experimented with Electrohydrodynamic Spray techniques and have reportedly produced consistent spray droplets. Clarke et al. have proposed using fluidic oscillators54 based on technologies developed by Perlemax55 which create high frequency pressure pulses in a gas stream and which are then directed through a diffuser plate into a thin film of salt water to create micro bubbles of consistent diameter. These burst to create nano-sized droplets. This method offers high energy efficiency, simplicity, immunity from contamination, and controllability of particle size.56 The spray devices can be located either at sea level or at altitude from an aerostat to which brine and gas are pumped. The technology can be installed on existing shipping going about their ordinary business, or on surplus ships to allow rapid deployment, or distributed globally at favorable fixed installations powered renewably by floating wind turbines. Competitive evaluations of all methods should be immediately started to identify the optimum approaches, and this should be extended to field testing, given that the risks are understood, minimal and controllable. It is entirely conceivable that during this evaluation each different method may be discovered to have unique characteristics such that a combined approach of technologies could provide the optimal solution. An extended application of MCB that should also be investigated through field trials is the addition of polyvalent salts to the brine solution which can capture atmospheric CO2 by turning it to carbonate in raindrops, thereby hastening its removal from atmosphere to sea and soil57. By using MCB techniques to achieve this, the contact surface area would be optimized to achieve maximum carbon dioxide capture efficiency with a view to substantially reducing residence time in the atmosphere. Robock et al. , MacCracken et al. , and Tilmes et al. , among others, have performed global model simulations that provide some, not particularly surprising, insights. Robock et al. found that high-latitude injection of sulphate aerosols into the stratosphere not only cooled the Arctic, but also, due to their roughly 1-year half-life, spread to sub-Arctic latitudes and unfortunately depressed the summer monsoon58. MacCracken et al. found that, just as high-latitude warming was amplified by albedo feedback, so was high-latitude cooling, making an intervention, on a per mass basis, more effective at high latitudes than at low latitudes. Conversely, Kleinschmitt59 analysis shows that the forcing efficiency may decrease more drastically for larger SO2 injections than previously estimated. As a result, the net instantaneous radiative forcing did not exceed –2Wm−2 for their simulations and they conclude that solar radiation management with stratospheric sulphate aerosols is still more complicated, probably less effective and may implicate stronger adverse side-effects than initially thought. Stratospheric sulphate injection can also fall into the troposphere to alter and enhance the structure of cirrus clouds which acts to prevent the radiation of heat to space in ways that are not yet clearly understood60. The rate of ozone depletion due to SO2 is not fully understood.61 Long-term reduction in ozone was observed following the Mount Pinatubo eruption which ejected an estimated 15-30Mt of sulphur into the atmosphere62. Though ozone reduction occurred during this event, disappearance akin to that experienced in the Antarctic did not. It is thus possible that in extremis a partial reduction in ozone may be an acceptable trade off when compared to the consequences of future temperature rises. At present, though various methods of delivering SO2 to the stratosphere have been proposed63, no technologies are mature enough to allow the long-term pumping of SO2 into the stratosphere in a way that is sustainable for a long period and controllable in the event of adverse effects. Any deployment would thus necessary involve the notion of starting slowly and building up to validate the technology and assess the impacts. This would be equivalent to imitating small volcanic eruptions and seeing how optimization can be achieved from the emerging data. The same fluidic oscillator technology that was described for the MCB can also be used to create films of long lived nano-bubbles in the ocean surface waters at high energy efficiencies and thereby increase the albedo of the ocean surface. Due to the extremely small size of these bubbles and the corresponding high surface area to volume, then viscous effects overwhelm buoyancy effects ensuring that the bubbles remain in suspension for prolonged periods, measurable in weeks. The bubbles can also be generated in such a way as to simultaneously lubricate the hulls of ships, thereby increasing their speed and/or fuel efficiency. This technology can be deployed on a regional basis to protect to coral reefs from bleaching and when done in conjunction with MCB can be used to control the temperature of the ocean surface waters in the path of oncoming tropical storms and perhaps even to steer them from dense conurbations. Critical to cooling effectiveness is that the bubbles are concentrated in the upper millimeter layers of water, where heat is absorbed by the ocean. If the bubbles can be kept in this region, then the ratio between cooling effectiveness and opacity increased to algae will be optimized. By strategically locating bubble generators in ocean currents, the suspended bubbles can cover large areas before their eventual dissolution to maximize the effectiveness of the technique. For example, one such location would be off Florida where the Gulf Stream would move the bubbles northwards and across the Atlantic, eventually cooling the Arctic. Fixed installations for these types of applications could be powered by renewable energy and be used for MCB. BECCS is the mainstay of the IPCC and COP methods for removing atmospheric CO211. The concept behind it is that biomass is burned in a power station, CO2 is captured and separated from the exhaust gases and then compressed and buried. In so doing, an inherent but unstated objective of this technology is to offer the prospect of a profitable, or at least a cost neutral, technical solution to the CO2 crisis through the sale of the generated electricity. This concept suffers several critical flaws that make it impossible to imagine how it could ever profitably or cost effectively work on a scale that is sufficient return atmospheric CO2 to the pre- industrial levels for the following reasons. 1.The infrastructure could not be built in time and it is unlikely that sufficient reservoirs could be found economically and safely to store the volume of compressed CO2 that is needed to offset current atmospheric levels. 2.Growing the biomass would conflict with agricultural land and water requirements which will be in increasing demand due to population growth and the loss of agricultural land from rising sea levels and other climate change related loss. 3.What biofuel crops are grown will be at the mercy of climate change inflicted droughts, wildfire and heat waves. 4.Most critically of all, fuelling a power station with biomass reduces the thermal efficiency as the biomass does not burn as hot as conventional fossil fuels due to its high moisture content, so at best a thermal efficiency of ~40% can be achieved without carbon capture. Given that 1 kg of wood releases about 15mJ, and produces 41 moles of CO2, then it can be calculated that to compress the produced CO2 to the 150 bar for transport by pipelines, the overall thermal efficiency will reduce to 8%, which is about the same as steam engines from the Victorian era. However, this assumes no energy for the separation of CO2 from the exhaust gases. If this energy is included in the calculations, then it only takes a modest 3.2kj/mole of CO2 to reduce the efficiency to zero. If the pressure were to be raised to above 150 bar, which is typically expected for most CCS installations, then these figures become even worse, making BECCS completely non- viable as either an energy source for the future or as an effective method to sequester substantial CO2 from the atmosphere. Full calculations are included in Appendix 1. Enhanced weathering of olivine minerals has attracted recent attention as a method of halting rising atmospheric CO2 with Mg-rich (Mg2SiO4) and Fe-rich (Fe2SiO4) olivine occurring often in nature. Olivine is mostly comprised of the Mg-rich type which can weather effectively. However, the use of Fe-rich olivine may cause adverse effects thus necessitating separation of the material which is potentially difficult and energy intensive64. Furthermore, olivine must be ground down to 1–10 μm to be effective65, which further increases the energy requirements. Once reacted, 1 mole of olivine sequesters approximately 1 mole of CO2. From this, it can be estimated that approximately 2,930 Gt of olivine are required to sequestrate 800 GtC from the atmosphere. To put this into perspective, iron ore is mined today at the rate of approximately 2Gt per annum. Thus, if the entire iron ore mining industry was transformed to mine olivine, it would take 1,500 years to mine sufficient material. This would then have to be processed with sufficient energy and then dispersed in shallow seas through the word while not causing catastrophic ecologic damage due to the fine particle size. It is inconceivable that this could be done on a time scale that is sufficiently quick to stabilize the environment. Direct air capture has been proposed as way of the extracting CO2 from sources such as transportation, small home furnaces, manufacturing processes and now, natural sources of CO2 from the atmosphere. These are the emissions that can never be captured by CCS being applied to the exhausts of power stations. A leading developer of this technology is Carbon Engineering66 which has been partly funded by the Virgin Challenge.67 The basis of their system is to use sodium hydroxide, most commonly recognized as caustic soda, to absorb CO2 from the air. The resulting solution is reacted with the calcium oxide to form calcium carbonate. This is finally heated to release a pure stream of CO2 and to allow the calcium to be recycled back into the process. In the prototype plants, the energy intensive parts of the process have been powered by natural gas, but the proposition is that these can be replaced by renewable or nuclear power in the future68. The main motivator of this technology is to use the output stream of pure CO2 as a feedstock into a renewable fuel process to create, using renewable energy sources, synthetic fuel that can replace fossil fuel derived products such as petrol, diesel and aviation fuel. Used in this way, and if the heating processes can indeed be substituted by renewables, then direct air capture falls into the category of low carbon and renewable technologies rather than a climate restoration technology. In this context, it offers a valuable and unique solution to enable continued operation of critical transport infrastructure in a zero-carbon economy without the difficulties associated with bioenergy fuels such as encroachment on agricultural or forest land. However, its scope to enable significant reductions of atmosphere CO2 is much more limited as the process will be constrained by the second law of thermodynamics due to it being improbable that the heat input needed to power its operations could be provided in any way other than fossil fuels on the scale needed and, in the time, available. Order of magnitude calculations can be made taking the assumptions of Carbon Engineering that industrial scale plants will have an output of 1MtCO2/year, with each one having its own power supply. When this output is compared with the current anthropogenic emissions of 33GtCO2 per year, (see Figure 3 and BP Statistics review2), then approximately 33,000 plants are needed. Currently there are 62,500 power plants operating around the world today with a capacity of 30 megawatts or greater69, thus given that in infrastructure terms each direct air capture unit is crudely equivalent to two power plants due the power supply needed and the direct air capture units, then the scale of new infrastructure just to negate current emissions from existing power plants would be equivalent to the entire global power producing infrastructure. To go further and sequester the legacy CO2 that has accumulated in the atmosphere, the ocean and the ecosystem since the start of the industrial revolution and to sequester non-power plant related emissions would increase the infrastructure requirements further, perhaps by at least twice. as Energy Return on Energy Invested (EROEI)70 is reducing globally, the energy needed for either running DAC or for providing the fossil fuels that would replace the displaced renewable power would seriously increase demand for fossil fuels along with the infrastructure needed to support this. The alternative would be to power this with nuclear but, on the scale needed, all the normal risks associated with nuclear such as time delays, cost over runs, public backlash, increased risk of radioactive contamination and supply of uranium would be intensified. 5.4.4 Carbon storage in biomass and soil through afforestation on land and in the sea. In 1977 Dyson71 first suggested augmenting the storage of carbon in organic matter by calling on solar energy and the photosynthesis process to extract carbon from the atmosphere. It has been estimated that the global biomass currently stores some 1500±200GtC and another 1500±200GtC are stored as organic matter in soils72 and by comparison approximately 150GtC must be removed from the atmosphere. The technical potential to sequester carbon in the soil of terrestrial ecosystems as well as restored peatlands has been estimated at around 3GtC per year, equivalent to 50ppm of atmospheric CO2 by 2100. This would be achieved by increasing the soil carbon pool by about 1 ton/ha/year and could be accomplished through a variety of means: no-till farming, cover crops, nutrient management, manuring and sludge application, soil restoration and woodland regeneration, improved grazing, water conservation and harvesting, efficient irrigation and agroforestry73. Thus, soil carbon and terrestrial ecosystem sequestration is a truly win–win strategy. It restores degraded soils, enhances biomass production, enhances food production, reduces the need for artificial fertilizer and irrigation, and purifies surface and ground waters while reducing atmospheric CO274. If this response of CO2 to the Black Death is genuine, it would have been greatly assisted by a more pristine ecosystem than exists today without areas that are paved, drained, polluted or denuded. Efforts are now being made to return as much of the terrestrial ecosystem as possible to a condition capable of maximizing carbon sequestration such as with the New York Declaration of Forests76. Since its inception in 2014, 415 companies have committed to its no deforestation pledges and it offers a partial counter to the pressures exerted by market demands for palm, soy, cattle and wood products. This parallels impressive efforts at re-forestation around the world. In 2016, volunteers in India smashed a world record by planting 49.3 million tree saplings in a single day and volunteers in Ecuador planted 647,250 trees from 200 species in one day. In 2014, Men of the Trees planted 100,450 trees in Perth, Australia in a single hour77. Furthermore, Myers and Goreu have proposed that there is enough land that has been deforested and abandoned in Brazil after it was over-run with useless weeds to stabilize CO2 through the establishment of natural forests and conversion of the weeds to biochar. With the new growth forests that result from these tree planting schemes, CO2 is absorbed and stored long term in the fiber of the trees. The challenge is to ensure that this doesn’t return to the atmosphere and so the resulting forests need to be protected in perpetuity, such that as trees subsequently die and decay they are replaced naturally with new trees and thus the same quantity of carbon remains fixed in biomass. Re-forestation has compromises to overcome that can limit its effectiveness. For example, in the immediate short term, dark boreal forests in the northern latitudes may decrease albedo and cause additional warming, China’s attempts to reforest the Gobi Desert to minimize dust storms have been hindered by extremely arid conditions and US forests are already under threat due to Pine Bark beetle infestations and wildfire. As climate change progresses further, it will impact on the sequestration ability of biomass, both in the soil and in forests due the increased risk of wildfires and the effective collapse in photosynthetic ability when temperatures are sustained above 400C78 and these conditions will become increasingly common in continental interiors, especially in the absence of SRM methods. In recognition of these limitations, then it is vital that soil enhancement focuses on the critical leverage points that can enhance carbon sequestration, the two most effective of which are biochar and enhancement of wetlands. The Terra Preta biochar that was created by the Indigenous Amazonian communities led to some of the most fertile soils in the world, and recent experiments have replicated the same fertility enhancement especially when additional nutrients have been added. Restoration of wetlands is particularly effective as these areas store carbon in the absence of oxygen, ensuring its long-term stability. It is estimated that half of all soil organic carbon is in wetlands, and half of this is in marine wetlands, but marine wet lands are being destroyed by draining and development. Restoration of coastal wetlands thus represents one of the most cost-effective areas of carbon sequestration. By enhancing these areas with biochar, carbon can be most rapidly sequestrated while at the same time improving the fertility of the soil and subsequent vegetation growth. Critically, the risk of heat wave induced fires and drought that are prevalent in continental interiors is largely eliminated. It has been proposed that that successful restoration of these marine wetland areas could provide sufficient carbon capture potential to stabilize global CO2 levels79 and initial experiments are planned in the mangrove swamps of Indonesia to allow quantification of this. In the same way that stratospheric SO2 injection takes its motivation from the observed cooling effect from volcanoes, then nutrification of the oceans to increase CO2 sequestration through phytoplankton growth has similar roots in observing natural processes. The most analogous is the temporary stabilization of the Mauna Loa CO2 trend following the Mount Pinatubo eruption which deposited an estimated 40,000 tonnes of iron rich dust in the world’s oceans with no adverse effects on marine life80 and further analysis of phytoplankton growth in the North Pacific following volcanic activity81. The Shamal winds perform a similar role in the Persian Gulf by maintaining an ecosystem against the odds through the regular deposition of iron rich dust across the sea surface82. 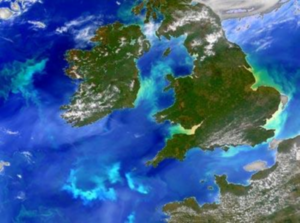 So far, 12 international ocean fertilization experiments have been conducted83 with all demonstrating the ability to create phytoplankton blooms which convert CO2 dissolved in the ocean into biomass and with none reporting deleterious effects. The objective of this approach will be to bring to life the large swathes of the ocean surfaces that are currently mostly devoid of life and thus are not contributing to the planet’s ecological balance or carbon pumps. Important secondary effects will also follow. The albedo of the ocean surface may increase, see Figure 19, along with ocean’s ability to create clouds through emissions of dimethyl sulphide (DMS), both of which will create significant planetary cooling, especially when nutrification is done in the sub-tropical regions. 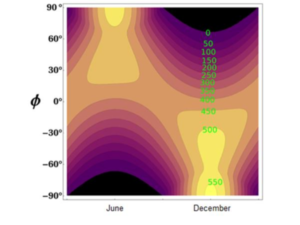 As phytoplankton growth responds to sunlight, then the albedo increase will happen in the areas of the planet with highest heat flow to maximize the effectiveness of the resulting albedo increase. When done in conjunction with MCB, the cooler ocean then prevents stratification and allows greater transport of CO2 to the depths by re-establishing the AMOC. Figure 19 Coccolithophorid blooms in the Celtic Sea 84. Of critical importance is that the conversion of CO2 in the ocean to biomass reduces acidification which is undermining the food chain throughout the ocean system. Of all methods of CDR, buoyant flake dispersal is the one most suited to directly address this. As colder waters absorb greater amounts of CO2 than warm water, then the problem of acidification is especially acute in the Polar Regions. If left unaddressed, the increasingly acidic polar waters will lead to highly diminished phytoplankton blooms. As shown in Figure 16, the solar radiation in the Polar Regions during summer averages 550 Watts/m2 over a 24-hour period. This high input would ordinarily occur with phytoplankton blooms; thus, their diminution due to high polar ocean acidification is likely to add considerably to the albedo positive feedback that is already happening in the Arctic region due to sea ice melt. An area of contention relates to how much CO2 is permanently sequestered by ocean fertilization, with detractors arguing that too much of the phytoplankton or faecal matter from higher organisms gets consumed before sinking to the sea bed. However, a two-stage process is necessary for carbon sequestration. The first stage is to convert CO2 into biomass using solar energy through photosynthesis. Some of this biomass will sink to the sea bed with the assistance of ocean overturning currents where it will remain stored for hundreds of years which is effectively sequestered, some will decompose back to CO2, but to enable better and more permanent sequestration, it needs to form the basis of other food chains. This enables the second stage of the process when CO2 is subsequently converted into calcium carbonate in the bones and shells for near permanent sequestration. Ocean fertilization experiments have revealed two key problems. Firstly, much of dispersed nutriating material sinks to depths beyond the reach of sunlight and is thereby unable to support photosynthesis. Secondly, the phytoplankton blooms are transitory and do not last sufficiently long for the ecosystem to respond and allow long term sequestration by the secondary life forms, such as shell fish. Because of these issues, ocean nutrification by the traditional means of using commercial, soluble fertilizers would have to be a continuous, energy intensive process that would be unsustainable in the long term. To overcome these problems, and to minimize the risk of toxic blooms, then a slow and steady release of the nutrients is necessary. This can be done with the dispersal of buoyant nutrient flakes which are made from silica rich rice husks to which lignin is applied to produce a surface coating of the necessary nutrients to optimize phytoplankton growth. These flakes then provide all the missing nutrients which are normally phosphorus, silica, iron and some other key trace elements. The resulting buoyant flakes are typically formed from mining wastes, non-commercial ore deposits, and low-cost renewable resources. It is anticipated that the flakes will provide micro habitats for small marine life for approximately a year before they disintegrate and sink, taking with them the intransigent carbon contained in their lignin and remaining husk component. In the regions of methane hydrate emissions, special nutrient supplementation can be provided to methanotrophs to help them convert methane directly into biomass. 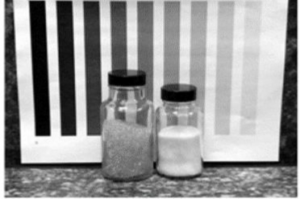 Initial lab-based experiments have now been conducted which have validated the concept of buoyant nutrient flakes and their manufacturing processes, with further trials planned. Despite no adverse effects being observed, calls to ban further ocean fertilization experimentation continue. These calls come from scientific, ethical and legal positions that are easily disputed. The scientific positions of the antagonists are typically twofold. The first is to claim that ocean fertilization detracts from other efforts to reduce anthropogenic CO2 emissions. However, ocean fertilization, or CDR of any type, cannot be used as a substitute to anthropogenic CO2 reductions for the many reasons outlined in section 5.2.2 of this paper. The second is exemplified with statements such as, “The intended effect of ocean iron fertilization for geoengineering is to significantly disrupt marine ecosystems. The explicit goal is to stimulate blooms of relatively large phytoplankton that are not usually abundant.”85 However, it is not the intent to disrupt marine ecosystems. Instead it is to the intent to recognize that the marine ecosystem is already seriously disrupted by climate change and to return it to as near to pre-industrialization conditions as possible, where abundant phytoplankton growth sustains food chains and sequesters CO2. Indeed, experiments so far have demonstrated positive outcomes from ocean fertilization, most notably Russ George’s iron fertilization experiment which led to bumper harvests of Canadian salmon86. The definition, which refers specifically to the ‘indirect’ introduction of ‘substances or energy’, is sufficiently broad to encompass emissions of greenhouse gases. UNCLOS, in other words, imposes on states a legal obligation to ‘prevent, reduce and control’ pollution of the marine environment through the emission of GHGs and to remediate the damage that has already been done. Thus, with the emerging catastrophes of acidification, deoxygenation, warming, stratification and de-nutrification there is a stronger legal argument to intervene than to not, especially when if the balance of probability can be demonstrated as being in favor of a positive outcome87. Without tackling these, it is inconceivable that the ocean ecology can survive in anything other than the most diminished state. The rapid rate of accumulation of methane in the atmosphere and its extreme short-term GWP dictate that an immediate response must be to remove the methane from the atmosphere. This can be done with a mixture of seawater and the iron salt, FeCl3, which, in sunlight, creates the radicals that oxidize methane into CO2 at a rate that is three orders of magnitude faster than with natural processes88. FeCl3 salts can be dispersed at very low concentrations simultaneously with the MCB efforts in the Arctic and elsewhere. Furthermore, on raining out, the iron would nutriate many more phytoplankton, with iron being the limiting nutrient in most ocean surface waters that are remote from land. These methods will require the presence of sunlight and thus will only be effective in the sun lit times, thus the problem of dark, long lasting, winter time methane may be impossible to solve. Arctic sea ice extent has already decreased drastically and virtually no secure multi-year ice remains, making it likely that the late summer will be ice free and of low albedo before the end of this decade25 so restoring sea ice artificially is an imperative to restoring the planet’s radiative budget, preventing subsea methane releases reaching the surface and preserving the ecosystem. A simple mechanical method for increasing winter ice, suggested by Flannery et al. 89 is the mechanical pumping or spraying of seawater to the top surface of ice where it subsequently freezes. This principle of ice thickening by seawater pumping has been proven by the construction of ice highways and, since 1974, by the oil industry with the construction of ice islands and ice platforms for drilling operations90,91. The difference being that the oil industry required very thick ice in a localized area to be built very quickly at the beginning of the ice freezing season, whereas climate restoration generally requires the maximum possible area of ice and the process used should be capable of being continued over the entire freezing period to create ice of sufficient thickness to survive the summer melt period and form the basis of multiyear ice. 1.The thicker ice that results at the end of the freezing season will survive through the critical May to July Arctic period when the sun is at its highest and the high albedo allows restoration of the planet’s radiative budget. Calculations show that the increased albedo can arrest melting sufficiently to enable enough ice to survive to form a base for the following season, thus allowing cumulative multi-year ice formation and even stable, permanent grounded ice. 2.As the seawater freezes, salt is displaced from the forming ice and brine is formed which will flow off or migrate through the ice. The brine will tend to accumulate around the edge of the freezing zone where it will flow back to the sea via cracks in the sea ice or ice dissolution. This results in a flow of high density saline water that will be significantly cooler than the surrounding ocean. The resulting increase in density, salinity and coldness of the brine causes it to sink and in so doing would contribute to restoration of the AMOC when done in specific areas, such as the Greenland Sea. A further critical advantage is that when the colder sinking water reaches the sea bed it removes heat from the methane clathrate plugs that exist within the fissures on the sea bed and so will tend to preserve them and prevent methane releases into the ocean. It is estimated that it is possible to increase ice thickness above natural levels, from one to many tens of meters over the course of a winter. The eventual thickness will depend on atmospheric conditions and what is most required at the location. Should 1m of ice thickness be obtained, then this is equivalent to putting the clock back 17 years93. Thus, over a couple of years of continued pumping ice conditions comparable to the mid-20th century can be achieved. Focused deployment would maximize the effectiveness of the intervention by targeting the first 10% of marginal ice cover and this would be more than adequate to reverse current trends of ice loss in the Arctic. The rate of heat transfer to the atmosphere is the main limiting factor that determines the rate at which ice can form. As latent heat released in the freezing process raises the surface temperature experienced by the ice sheet, then pumping must be temporarily stopped, or its lateral direction changed, to allow the temperature to equilibrate, resulting in an intermittent or variable direction pumping regime. This was the general mode of operation that was pursued when ice road makers or oil industry operators constructed ice platforms. Secondly, as the ice sheet thickens from above, it makes it more difficult for the heat released by ice freezing at the ice–ocean interface to reach the surface and this is a natural consequence of thicker ice, hence the only way ice can be thickened quickly is by pumping seawater onto the surface of the ice. A minimum intervention would be to restore the ice lost due to current rate of melting which from 2016 to 2017 was approximately 1,000 km2. To pump sufficient water onto the winter ice to equate to this volume through the creation of a 2-metre-thick layer of ice that could last the summer period would require approximately 1GW of pumping power to be available over the freezing period. This assumes an efficiency of 75% due to brine flow back to the sea. However, the eventual power consumption would be highly dependent on many interacting factors, these being the albedo increase that is achieved by the ice, the ice thickness that is generated, the shape of the ice formed, the wind conditions and the melt rate due to the accumulated ocean heat content and methane concentration. Understanding the sensitivity of ice formation to each of these is essential and can only be established robustly with field testing. Critically, the scale of deployment will also be highly dependent on the cooling effect of other proposed technologies such as MCB and buoyant flakes and without these being deployed on scale to reduce the heat flow into the Arctic, then the power consumption to maintain a steady ice state will increase with time. Already, the high heat flow into the Arctic, combined with the already high ocean heat content, is reducing the feasibility of an ice thickening program without substantial intervention elsewhere in the climate system. Though the estimated 1GW is extremely small in terms of global power output, being on the scale of a single nuclear power station, the challenges of distributing this power reliably across the Arctic and over shifting ice will be enormous. Most likely, it will be it need local energy sources and distributed power production, which in the Arctic winter means using the fortuitously plentiful wind. While the other basic components of a pumping device are simple and would include a large buoy or floating platform, a wind turbine, an energy storage device such as a gas accumulator, a subsea pump and a pump nozzle, getting these to work reliably in the harsh Arctic environment will complicate the engineering challenge and take time to perfect as well as possibly needing regular intervention throughout the year. The resulting system of wind powered pumping devices would have to be manufactured and delivered to the Arctic Ocean, they would need tracking and repositioned each season, they would need ongoing maintenance and possibly recovery if they had not been stabilized by grounding or had flowed out of the Arctic through natural movement of the ice flows. All this will require the development of a complex logistic network and this will be a critical activity that must be completed before full scale deployment can commence. While the scale of this undertaking is considerable, and given that 1GW of power is needed, then 100,000 pumping units would be needed if each is powered by a 10kW rated wind turbine. Whilst the scale of this is large, it is considerably less than the scope of the U.S. automotive industry which manufactures approximately 8.5 million cars per year, or the execution of the Iraq War. Thus, it is economically achievable93. The termination problem is frequently cited as a reason not to pursue climate intervention, with general the position being put forward that should a Solar Radiation Management intervention stop, then a catastrophic step change in temperature will occur on its termination which will be beyond the adaptive capabilities of the ecosystem94 and be caused by the full effect of the cumulative anthropogenic CO2 emissions that would have continued during its deployment. 1.A climate intervention programme must be implemented in conjunction with continuing efforts to reduce atmospheric CO2 through emissions reductions and CDR and it has already been established in this paper that without these, the effectiveness of a SRM programme would either be limited or, in extremis, be overwhelmed. Whilst good efforts are being made in renewable energy generation, a more fundamental change to the current economic model must be considered which ensures funding of a climate restoration programme while simultaneously curtailing the financial incentives to continue with fossil fuel consumption. This requires a carbon tax or analogous system. We propose a market-based approach in Section 5.8to enable this. 2.Conventional thinking on the termination problem does not consider the implication of hysteresis and nonlinear change as discussed in section 5.2.2. If climate intervention was pursued to a sufficient scale to push the climate back to its previous level of stability, such that albedo had increased through increased ice cover, methane emissions had been brought under control by reducing the heat flow in the Arctic, ocean acidification had been reversed and ocean heat content reduced, then the scale of climate intervention could be safely reduced as the planet’s own feedback process would now operate to keep temperatures stable. 5.7 Which options are optimal? Section 5.2.3 discussed the essential characteristics of a climate restoration program and emphasized the necessity of providing a future proof solution that could be deployed for a prolonged period and be largely sustainable during times of economic and political chaos. effectiveness by working with natural processes and not against them and that the synergies between them enhance and amplify the outcome. While the proposals for ice cap thickening remain theoretically possible, in practice an effective deployment would require a suitable logistic network to be developed before critical climatic and political tipping points are past. Given the extremely low rate of ice formation this winter (2017/18), then the concept of ice cap thickening is fast approaching the point in time when it will not be viable without the support of an extensive prior SRM intervention. The evident closing of this window for intervention should be taken as a warning that delay will render the other prospective climate interventions ineffective. Given the stakes, no solution should be taken off the table prematurely and it is prudent that research and field testing starts on the most prospective and viable options, subject to them meeting basic scientific and environmental checks. 5.8 Development of sustainable economic models. 5.8.1 A prospective insurance industry led model. 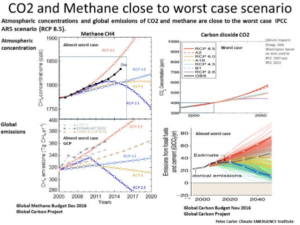 With climate change following its current trajectory, it will cause costs far greater than the total value of the global economy with the potential exposure just from methane releases having been estimated at 60 trillion dollars95. These costs will come about through the simultaneous events of large scale death due to heat stress, extreme weather events, lack of water, famine, disease and pandemics, mass migration, civil unrest, war and the destruction of critical infrastructure at sea level, such as cities, ports, utilities, agricultural land and nuclear power plants. The irreversible (if unaddressed) nature of climate change makes it clear that an essential part of mitigating against these costs is to fund a climate restoration program in a manner that is sustainable, equitable and largely independent of political changes. To date, the assumption has been that funding for such a program should be a government driven initiative. However, this quickly runs into fundamental questions of equity that would appear to be impossible to quickly overcome and would likely cause a rerun of the difficulties that have already been experienced since the Kyoto I round of climate change talks. For example, should China, which now emits the highest level of emissions shoulder the biggest burden of costs, or should it be the beneficiaries of its consumer goods such as Europe and the USA, or should it be the biggest producers of fossil fuels such as Russia, the Middle East and Australia? For almost any set of rules that are chosen, the conflicts and potentials for failure are far easier to imagine than the potential for success, especially as many of the nations involved in this equation have intense and growing geo-political rivalries. The complication is compounded by the fact that this must be done whilst simultaneously driving down fossil fuel emissions to as near to zero as possible. function. In this context, the insurance industry is as vital to the smooth operation of the global economy as the energy industry is. However, because of climate change, the insurance industry is facing a bleak future. It is already experiencing exponential growth in liabilities whilst returns on investments are stagnating as the global economy is starting to struggle with the economic overheads from climate change. This combination represents a foretaste of worsening future economic conditions and there is widespread acknowledgment that long term investments, such as life policies and pensions, are already at such risk96 that the industry could be liable for mis-selling claims on their sale of long-term investments. So far, the insurance industry’s response to this is to increase premiums and amortize the risk through further reinsurance. The recent initiation of FloodRe97 in the UK is a case in point, whereby the financial risk of climate change driven damage to households is amortized through an additional premium on all household policies, irrespective of the climate change related risk exposure they face. While this will provide funding to cover damage on a par with that experienced in recent years, it is ultimately a short-term measure that will be overtaken by events. It further illustrates the separate dilemmas facing the insurance companies and the central banks that regulate their operations. The first dilemma that the insurance industry faces is because climate change is a common mode effect that simultaneously impacts all areas of operation, then the normal principles of reinsurance to amortize risk cannot work in the long term. The second dilemma for the Central Banks and regulatory authorities is that their principle role is to ensure that the insurance and financial markets operate with fair competition between companies to the benefit of customers, governments and the public is counter to the need to force insurance companies to co-operate to tackle a common threat. This directive makes no exemption for climate change which increases the risk that the exposure to a single severe incident (such as Hurricane Harvey which flooded Houston) breaches the 1 in 200 threshold or that continuous exposure to events at this scale depletes economic capital due to the consistently higher claims elsewhere within an insurance company’s portfolio. The requirement to ensure competition between the insurance companies has also led to paradoxical and inequitable sharing of risk. Thus, a hypothetical household on a hill and powered entirely by solar and which has no climate change exposure at all must contribute to climate change risk through the Flood Re mechanism, whereas the [high carbon] energy sector which is directly responsible for climate change risk only accounts for 4% of total UK premiums13 and thus can contributes little to the overall future risk profile that they are creating. While this iniquitous apportionment of risk is specific to the UK, it will be largely analogous to other developed economies. Thus, we propose that a third-party insurance premium be added to the insurance contracts of the fossil fuel companies with the intent of raising the funds for a climate restoration program. This is analogous to the third-party insurance premiums that drivers pay on car insurance to cover the risk they cause to other road users. In the same way that this prices young drivers out of high performance cars to the benefit of all road users, then pricing in future climate change liabilities onto the insurance premiums of the fossil fuel companies will incentivize the transition to a low carbon economy for the benefit of all. Within this mechanism, the liabilities to climate change loss can also be incorporated as an alternative to the FloodRe reinsurance model, thus providing a mechanism for a more equitable risk management strategy. Once the costs of the climate restoration program are established, the additional third-party insurance premiums can be set by actuaries, most likely within the reinsurance industry, in the normal way that they would price any risk and without there being any need for probably contentious and long drawn out negotiations amongst nation states or industries. This objective of this approach is thus to raise the funds in a sustainable and equitable way while ensuring carbon emissions are driven down to a level that is compatible with long term habitability of the planet. Because of the risk exposure that the insurance markets face through climate change, it is in their direct interest to ensure that this works. In effect by engaging the insurance markets in this way, they become a de facto enforcement agency for climate change policy. The alternative is to attempt to introduce a carbon tax by getting all nations to agree on its imposition. However, many of the nations that must collectively impose a similar punitive carbon tax also have direct and intense competing interests which make short term survival more of an issue than long term co-operation. These competing interests which will intensify because of climate change make the trust necessary to agree to the mutual sacrifice inherent with the imposition of a significantly onerous carbon tax impossible to imagine. In the parlance of game theory, nations are stuck in the Nash equilibrium position where they collectively choose the worst-case long-term outcome to maintain short term competitive advantage against competitors. An assessment of the low probability of succeeding with a conventional carbon tax approach can be judged by the failure of this to make any progress despite years of recognition that a price on carbon must be imposed despite the increasing evidence of climate change. Even if a carbon tax could be introduced, then there is no guarantee that the funds raised by it would be directed towards to a climate restoration program. This approach of empowering the instance markets to raise restoration funds through insurance premiums takes lessons from the banking collapse of 2008 when the collapse of the insurance giant AIG pushed the financial markets into freefall and forced politicians around the world to develop bailout packages to the tune of trillions. This event was the financial market’s signal to the politicians that the economic situation of high debt and high oil prices was unsustainable and that politicians had to take painful action to stabilize the economy. In effect, the financial markets had demonstrated their ultimate power over politicians. Climate change now poses a bigger long-term threat to the insurance markets than those factors that combined to lead to the 2008 crisis. It is now incumbent on politicians to proactively acknowledge the immense change to the economic landscape this will create and to effectively and responsibly enable the power of the markets to drive change by empowering the central banks to oversee the introduction of climate change insurance levies on fossil fuel extraction. This must be done before climate change reaches critical points of irreversibility which will expose the inherent inequities within the insurance market and impose crippling losses of such magnitude to the insurance industry that an unrecoverable economic collapse becomes unavoidable. 1.To provide the expertise to independently evaluate laboratory and field trials and ensure that proposed solutions will be effective, scalable, controllable and without unacceptable adverse effects. 2.Ensure that the pace of development and deployment is fast enough to be commensurate with the scientifically predicted rate of change to the environment. Subject to satisfactory resolution of 1, this is likely to be of more importance than ensuring that adverse effects are avoided. 3.Confirm and define the climate stability targets and scenarios that a climate restoration programme would seek to achieve and to provide expert and independent assessment on the proximity to irreversible climatic tipping points. 4.Provide full transparency of the research, the costs, the progress made towards climate stabilisation and associated risks or unforeseen circumstances that arise such that preventative action can be taken. 5.Provide independent advice and guidance to politicians and assist in the drafting of agreements, legal or otherwise. 6.Ensure that there are opportunities for representation of all parties, such as governments, industry, expert bodies, NGOs and indigenous populations. 7.Ensure that economic and political structures are in place to ensure that long-term financial stability of a climate restoration programme can be assured while simultaneously providing incentives to cut fossil fuel production. This challenge will have to be met as demand for fossil fuel production increases due to population growth, increased aspirations of the developing world, reduced EROEI and the introduction of adaptive measures to climate change. Appendices and References can be read in the PDF document.